Save up to 35% on a PCG subscription. We're currently hosting a massive sale on PC Gamer UK subscriptions, saving you up to 35% off the cover price—and up to 46% off the digital edition. So why subscribe to our magazine, which has been running monthly for almost 25 years? No doubt you've read it at some point or another, perhaps while on a toilet, or in a doctor's waiting room—a doctor of extremely good taste, we should point out. It's a cool thing to have delivered to your door every month, basically. We've rounded up some highly convincing reasons you should treat yourself to a PCG sub for the holidays below. Every month, we give away free codes with the UK print edition of the magazine. In the past year, this has included a number of treats: Far Cry 3: Blood Dragon, Tropico 4, DLC for Total War: Warhammer and Warhammer: Vermintide, an exclusive pet for Runescape, a Steam key for Syberia and early beta access for The Witcher spin-off Gwent, among many others. You'll get a decent slice of downloads over the course of a year in addition to your lovely, shiny magazine. This is the part of the magazine that everyone enjoys the most (both the writers and the readers). Extra Life is our place to celebrate the PC games we love, so we're not just discussing them in the traditional framework of preview-feature-review found elsewhere in the magazine. This means you end up with some idiosyncratic writing in our Now Playing write-ups, past games revisited in Reinstall, interesting diary features and tons more. To give a little bit extra to our UK readers, we produce these gorgeous subscriber covers every month, to make them feel more like collectors' items. And they're very nice—they're usually the last thing to be designed every month, which gives the editorial team great anxiety when making sure we haven't spelled the name of the game incorrectly at 9PM on a Wednesday. "Oh no, it's not called Far Croy 5!" And so on. The magazine team has been working on some really elaborate long-term features of late, the first of which was last month's making of Civ feature above. Every month, you'll find a gorgeous array of new and original, print-friendly longform features. We continue our long tradition of daft back page gags, the funny-to-not-funny ratio of which is at least a respectable 3:1, depending on the team's mood that month. Here's 2016's selection. We'll be reviewing 2017's next week. They're particularly good if you enjoy jokes that are three parts 'heh' to one part 'sigh'. 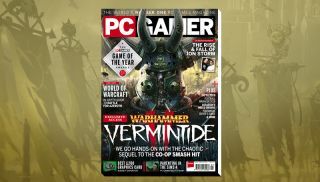 Subscribe to PC Gamer UK now for up to 35% off the cover price.